Breakfast at 5.17am. Apparently I choose the wrong breakfast. 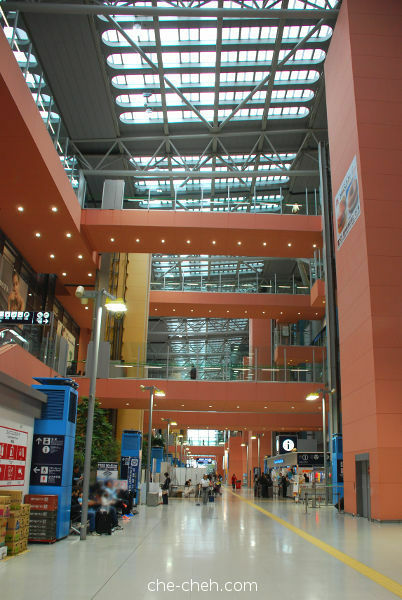 Kansai International Airport, Osaka. We touched down at 7am on a cloudy day. Guess who I saw when I was queuing at the immigration in Kansai International Airport? Marina Mahathir! First thing we did after coming out from the arrival hall was to buy a sim card. 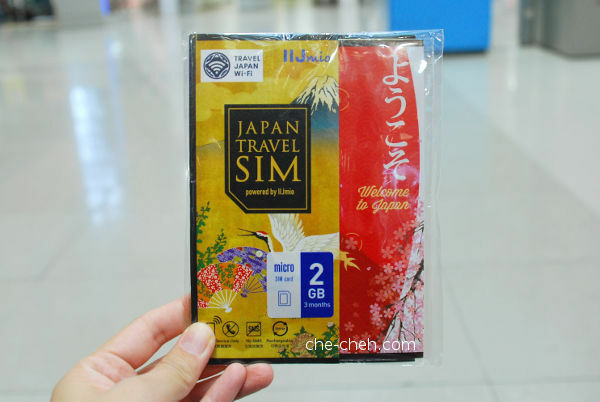 We got this 2GB Japan Travel Sim (validity 3 months) data plan by IIJmio for 4320 yen. Most prepaid sim card for tourist has validity for 14 days (max) and since we will be in Japan for more than 14 days, we got this one which is valid for longer period. So it’s about RM10 for 16 days of usage. By day 16, we nearly used up the 2GB. We mainly use it for Google maps and for checking train schedule and weather. And should you use up the 2GB, you can recharge it. Setting up the phone was easy (come with instructions). I have no issue with the coverage. Everything was good. Check out https://t.iijmio.jp/en/index.html for more information. 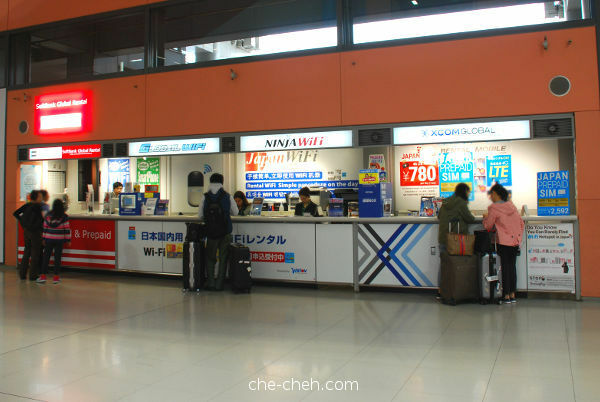 We bought the Japan Travel Sim at this Global Wifi counter at the South wing of arrival hall (1F) in Kansai International Airport. They don’t accept cash. Only credit card. We initially went to the North wing (same floor, few meters away) which also has a Global Wifi counter but were told they don’t sell it. 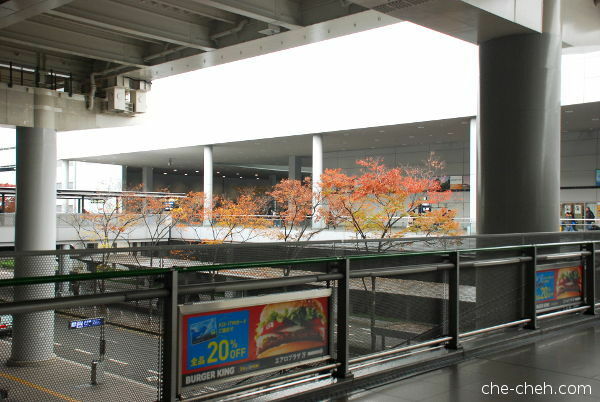 Next, it’s a short walk to Kansai Airport Station. 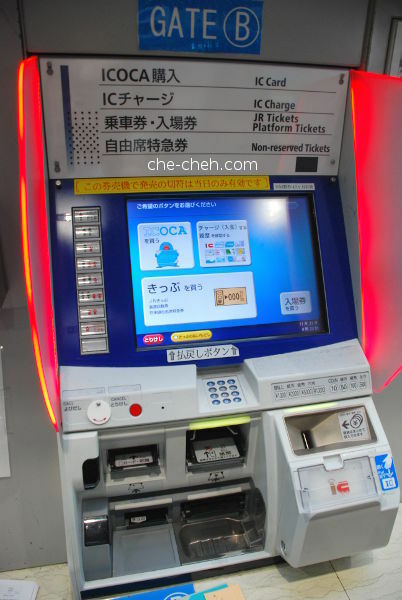 We bought ICOCA cards using this machine. Select English to buy the cards. 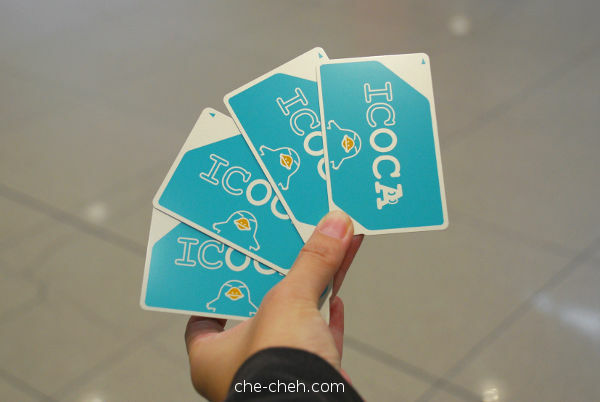 ICOCA card is a transport card synonym with HK’s Octopus card, London’s Oyster card, Seoul’s T-Money and Taipei’s EasyCard. I didn’t buy any other passes (except in Fujikawaguchiko), only used ICOCA for my 16 days travel in Japan. It’s really convenient! The only transport that cannot be used with ICOCA is the Shinkansen (bullet train) and some other local transport network like in Fujikawaguchiko. 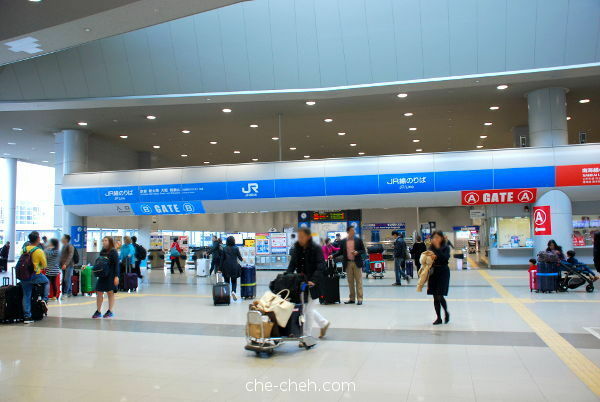 There are few ways to travel from Kansai Airport Station to Osaka Station and I choose the most budget way but longer travel time (by 11 mins only compared to using JR Limited Express Haruka). On board JR Kansai Airport Rapid train, 1190 yen which departed at 9.48am. The reason it took longer was because it’s some sort of a commuter train. It stops at many stations along the way. 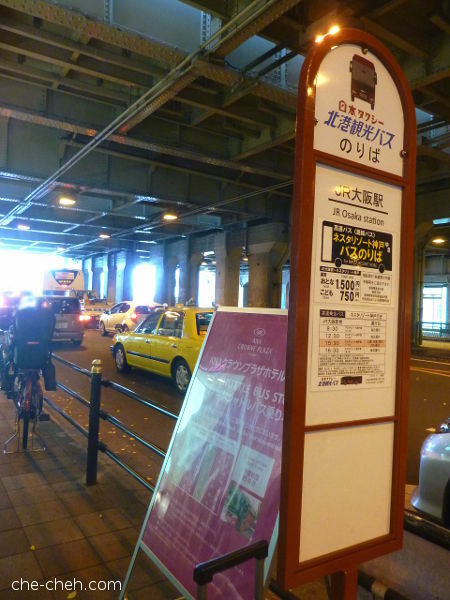 In this photo, it was practically empty and by the time we reached Osaka Station, it was full. As you can see, the train is spacious enough for us to place our luggage beside us (at the walkway). 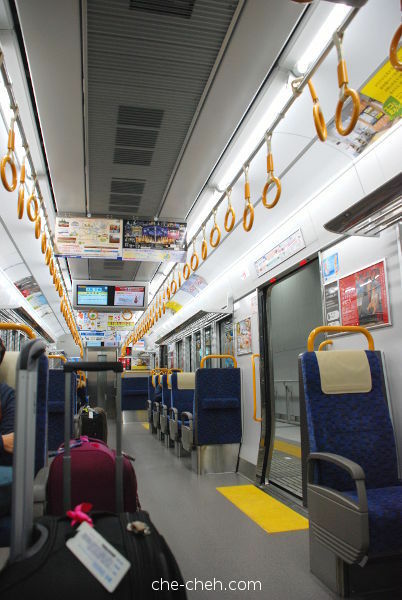 You can even change the direction of the seat on the 2 seater; as in sitting following the train’s direction or opposite by pushing the seat’s back. Coz you know some people cannot tolerate travelling in opposite direction. Cool eh? 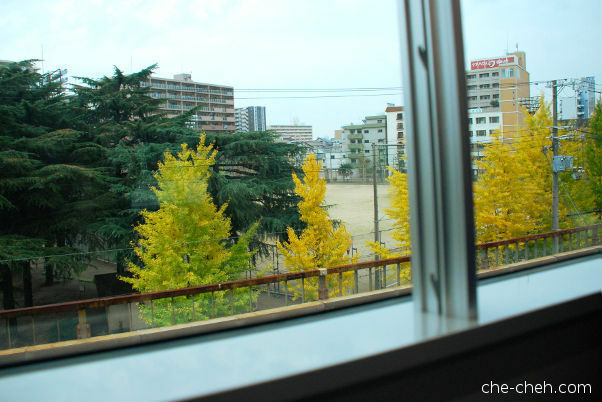 Along the way we dozes off (advantage of longer train ride) and then we got our first view of the autumnal ginkgo trees! So prettyyyyyy. We reached Osaka Station at 11am. So busy is this station that I felt like I’ve stepped into a different world. Everyone were walking VERY fast. They knew exactly where they’re headed. And here we are, looking as if totally lost. But we’re not actually lost; we’re just looking at signage while trying not to block the waves of people with purpose! We stopped by 7-11 in the station to get some snack. On the right is okowa (Japanese sticky rice) 130 yen and left is onigiri 110 yen. 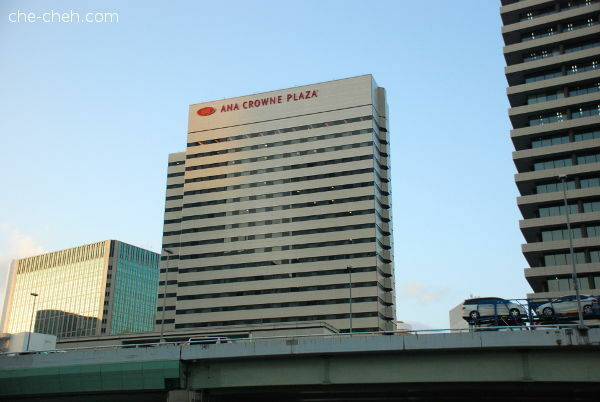 We then walked to Ana Crowne Plaza shuttle bus stop just outside Osaka Station. It’s a free shuttle for Ana Crowne Plaza guests. 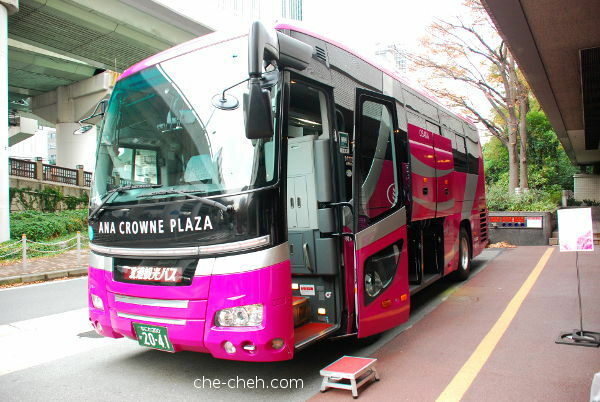 Ana Crowne Plaza shuttle bus. Check out the cute stool; really thoughtful of them. 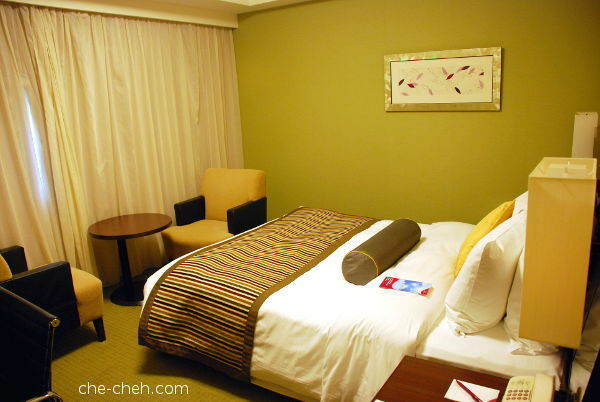 We stayed at Ana Crowne Plaza Osaka for 3 nights. It’s a 4-star hotel and most probably my first ever 4-star hotel stay. I don’t usually stay at pricey places but this situation is different because we didn’t pay a single cents throughout our stay. 🙂 We redeemed my sis’ Reward Nights points for 2 double bed standard (non-smoking) rooms x 3 nights. And because we didn’t pay a single cents, I have a nagging feeling we will be treated lesser than those that paid full price. Well, guess what? 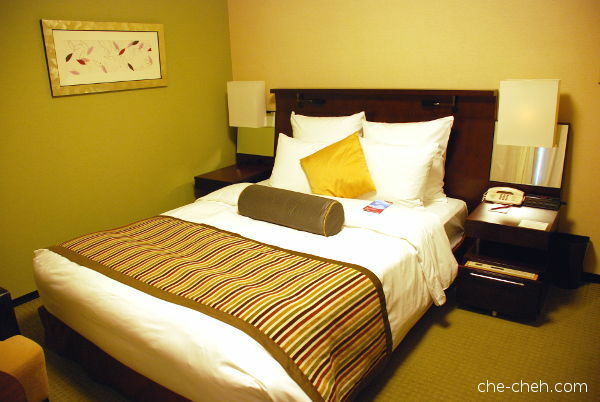 I am FULLY SATISFIED with Ana Crowne Plaza Osaka’s hospitality. They are really professional. I would definitely stay with them again if I’m no more a cheapskate gal (hahaha). Fyi, one room per night is about US$150 (RM670 based on present time exchange rate)… sam tung if I have to fork out this much. So, I’m really grateful for this. Yes, we got to save $$. 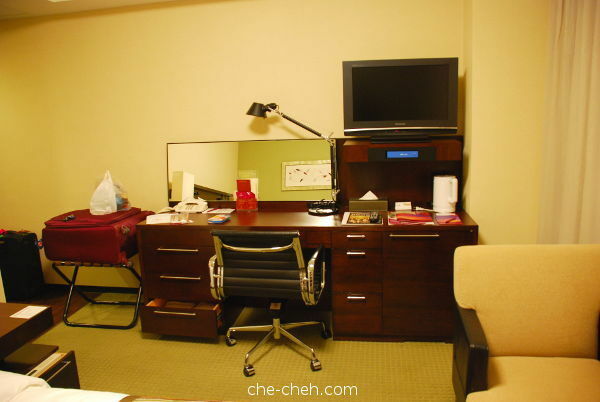 Ohh and we also got upgraded to double rooms at the 23rd floor (tsk, suites are at 24th floor – top most floor). Thank you. Thank you. Thank you. 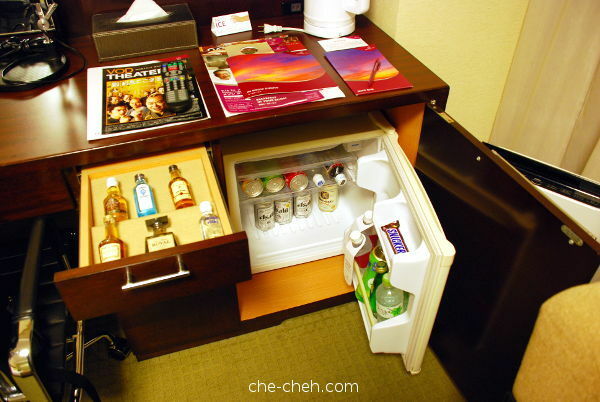 Nope, we didn’t touch anything here except the complimentary mineral bottles. It’s my first encounter with an air purifier in a hotel room. Didn’t use it though. Top right: Hello! Vanity area. Bottom left: Love this toilet. Love the seat warmer the most. 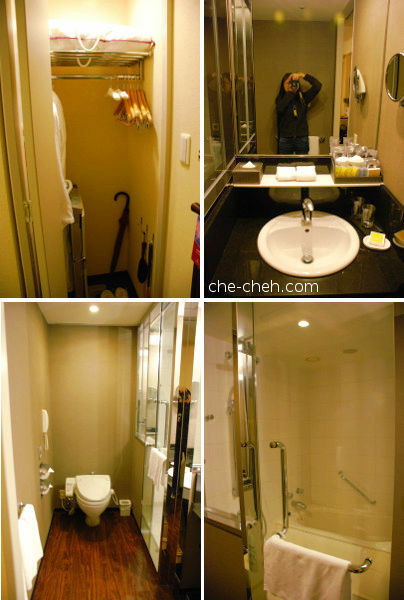 I actually find the toilet and shower area to be more spacious than the sleeping area. LOL Not complaining. After checking in, we decided to give our tired body a rest. By 3pm, we are ready to tackle our first shopping activity. This is the road just beside Ana. 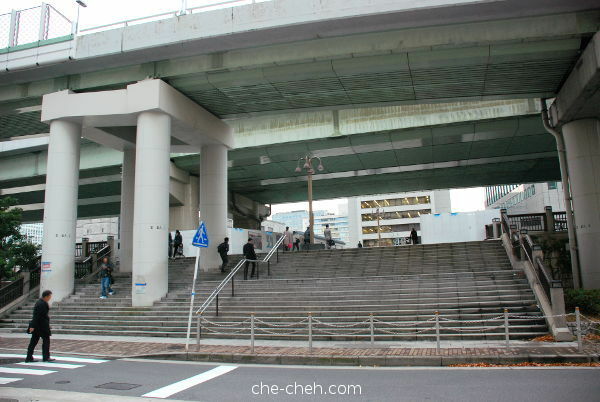 Walking up these steps will take you on a bridge (called Nakanoshima Garden Bridge 中之島ガーデンブリッジ) crossing Dojima river and then walking along the river on Nakanoshima to Yodoyabashi Station. I love walking here. It’s so pleasant and beautiful. I’ll show more in next posts. Nakanoshima is a narrow sandbank (island) which reminds me of Paris’ Île de la Cité which I have the opportunity to visit four years back. I love both Nakanoshima and Île de la Cité. From Yodoyabashi Station, we took the subway to Namba Station. We’re heading to Sennichimae Doguyasuji but got a bit lost because the subway exit we went to brought us to steps that climb higher and higher inside a building. Weird! So I suggested tracing back to another exit and walk outside. Easier this way. 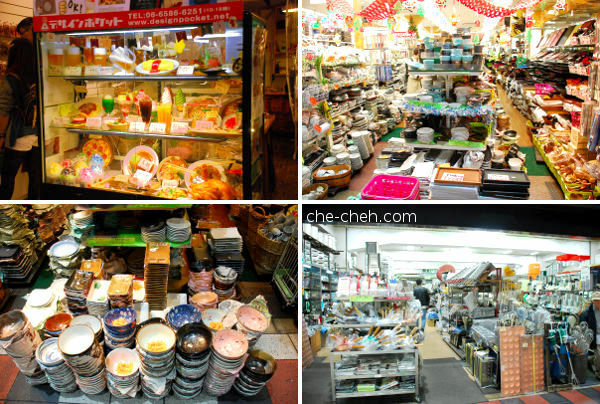 This is Sennichimae Doguyasuji 道具屋筋商店街, a covered shopping street selling restaurant related supplies and decoration. 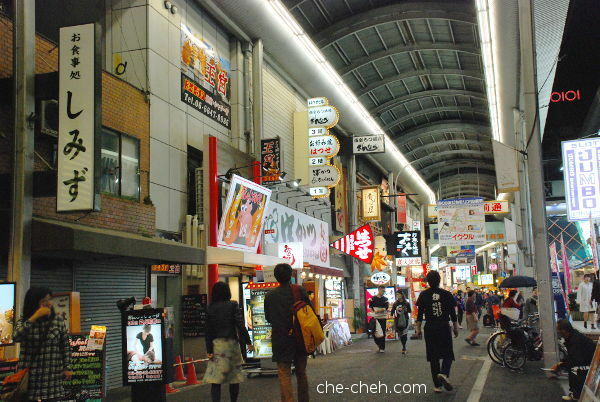 Compared to Kappabashi (Tokyo’s kitchen street), the number of shops here are way lesser since the street is shorter. Nevertheless, I found what I was looking for here. Shops at Kappabashi are mostly selling repetitive stuff. 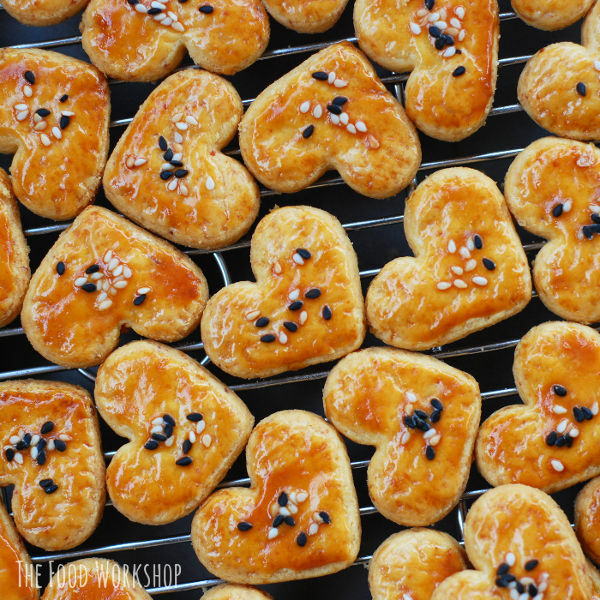 Lots of things to buy here for cooking and baking lovers. 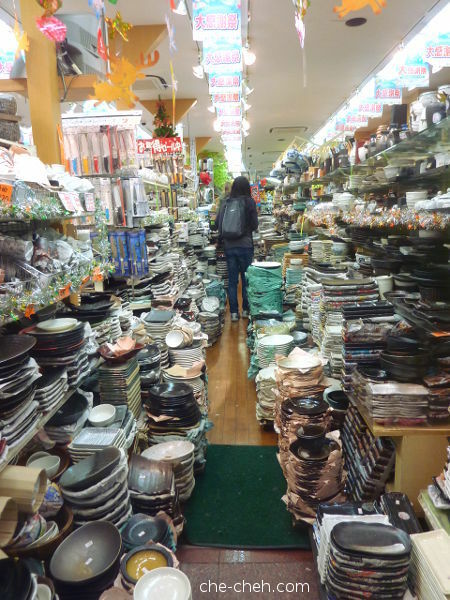 This shop has the most narrow walkway with plates and bowls stacking up high. I had to be extremely careful here. This photo didn’t do justice. I almost didn’t went in but glad I did. Most shops at Sennichimae Doguyasuji started closing at 6pm. 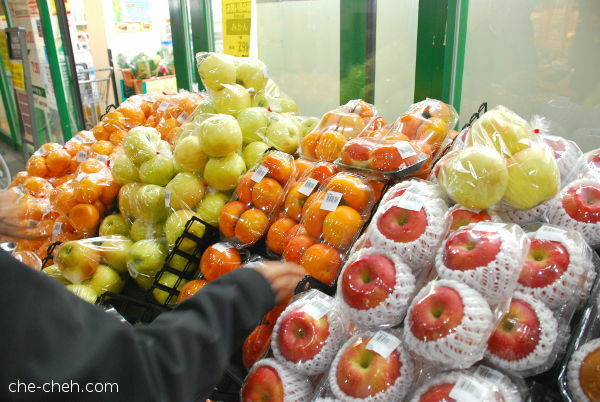 Stopped by A-price to buy persimmon since it’s persimmon season (autumn). After shopping at Sennichimae Doguyasuji, we stopped by Takoyaki Doraku Wanaka (just outside the kitchen street) to get our first takoyaki fix. 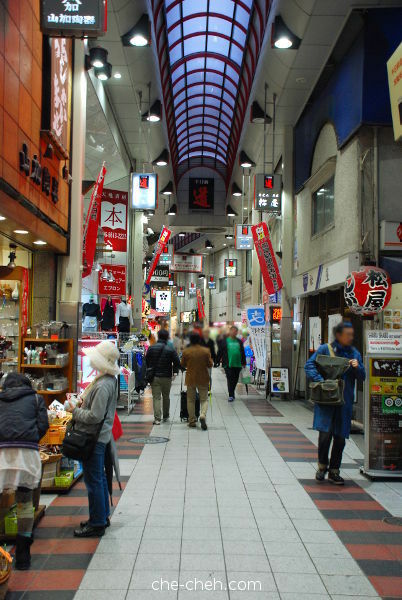 Besides Sennichimae Doguyasuji, there is another covered walkway nearby lined with restaurants. We passed by here while heading to our dinner place. For dinner, we had okonomiyaki at Fukutaro. Check out the link to read more. We stopped by 7-11 and Foodium (24 hrs) near Ana to grab some snacks and breakfast for tomorrow. Back at the hotel, it’s time for persimmon. 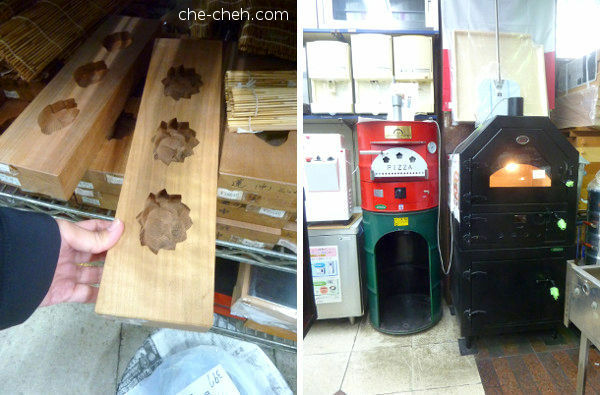 We bought 2 pieces at 322 yen (~RM12). Place of origin: Nara. 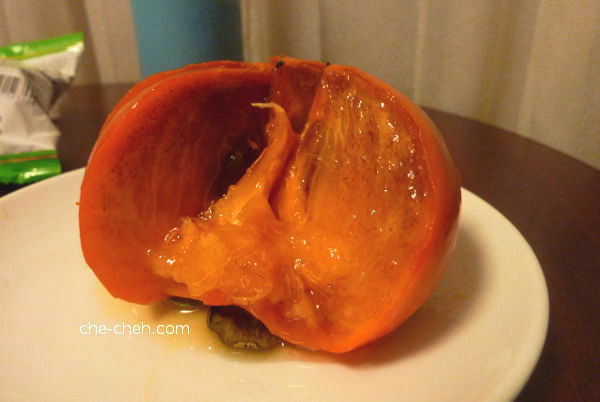 Of all the persimmons I sampled in Japan, this is the BEST one. It’s very soft, sweet and juicy. Yummmmmmmy! That’s all for day 1. More to come. Hi Dawn, Wow… I would love to visit those places too. Ohhh Christmas markets! Too bad about your stolen wallet. Gotta be careful next time ya. Finally, I’m here at 2am reading your blog post lol! What?! You saw Marina Mahathir? And you even bumped into Michelle Yeoh last time? Which VIP will you bump into next? Lol! What?! You have to self check in? 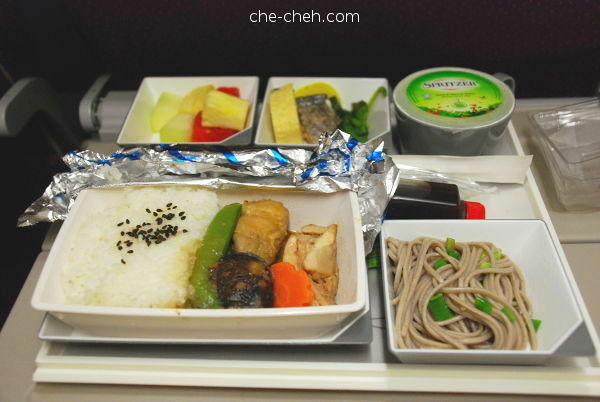 MAS is not a low budget airline right?! Oh the food was horrendous. Maybe you should not fly MAS any more. Haha! Wow! 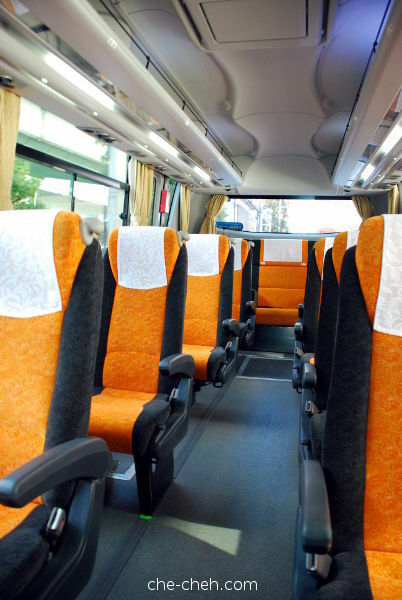 I like that stool for the bus! Japan. They are of a different world. Lol. Yup, I like that stool idea too. Wow! 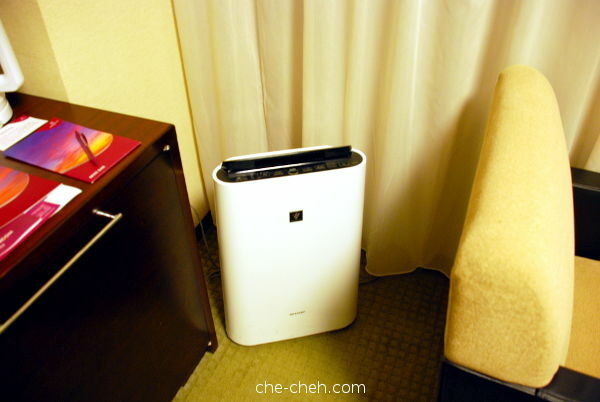 Air purifier in the hotel room? So good! Nice hotel but so expensive! Ya good hor. I can’t afford this place if I were to use my wallet.